This wine is obtained by a careful selection of Aglianico grapes grown in hilly terrain, limestone-clay soil at an altitude of 200 - 350 m.a.s.l. in the area of ​​Solopaca located on the slopes of the Regional Park Taburno-Camposauro. An espalier farming system is employed giving a yield of 80 qq/ha from vines with an average age of between 10 and 25 years. The harvest takes place during the month of October. The grapes are harvested by hand and conferred to the winery; there follows the de-stemming and soft pressing of the grapes. The vinification is carried out by maceration with the skins which are continuously re-submerged into the must; fermentation takes place in stainless steel tanks at a controlled temperature. After a short time in large Slavonian oak barrels, the wine is aged in barrels for a period ranging from 18 to 24 months; it is then bottled for further aging. 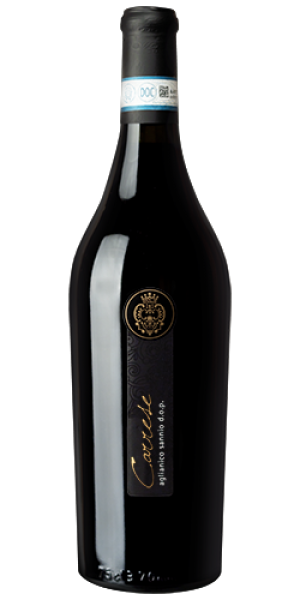 The color is an intense ruby ​​red, the aroma is complex with pleasant hints of ripe red fruit and jam with hints of spice. The taste is fascinating, complex with good aftertaste, pleasantly tannic. Ideal for pairing with red meats and game. Temperature of 16-18° C.